DES MOINES, Iowa (AP) – Cornell’s Kyle Dake will seek to take his place among the greatest college wrestlers of all time. Penn State will attempt to solidify its status as the nation’s pre-eminent program – in the backyard of its biggest rival, Iowa – when the NCAA championships start Thursday in Des Moines. 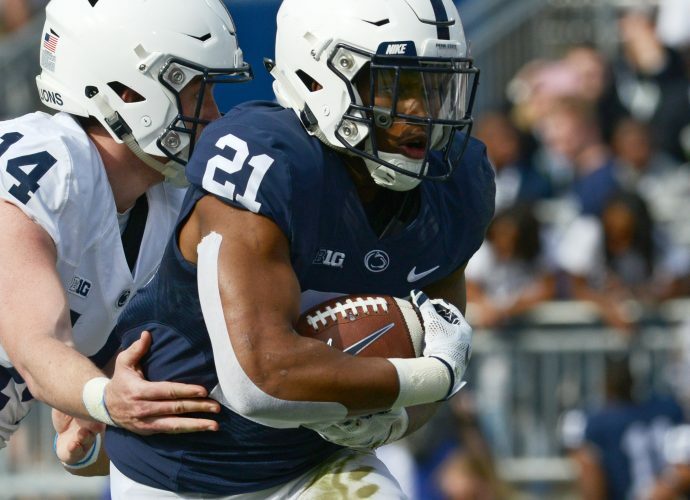 The team race figures to be a competition between the Big Ten’s best, led by the Nittany Lions, Hawkeyes and Ohio State and Minnesota, along with Oklahoma State. But Dake will be the main draw. The three-time NCAA champion is just three days away from possibly becoming the first wrestler to win four national titles in four different weight classes. “I think the most important thing for me to recognize is that I’ve got to get there before I can make history,” Dake said. Dake has bumped up a weight class every season, progressing from 141 pounds to 149 to 157 and, as a senior, 165 pounds. The constant movement hasn’t stopped him yet. The Ithaca, N.Y., native became the first collegiate wrestler to win national titles in three different weight classes when he beat Iowa’s Derek St. John to cap a 35-0 season in 2012. Dake’s decision to finish his career at 165 pounds put him in line to face defending NCAA champion David Taylor of Penn State, last year’s Hodge Trophy winner as the top overall wrestler in the country. Dake has beaten Taylor in an exhibition and in an NCAA-sanctioned match already this season. A third meeting would be perhaps the most highly anticipated collegiate match in recent memory – and a victory by Dake would make him the third wrestler with four NCAA titles, joining Pat Smith and current Penn State coach Cael Sanderson. “I’ve been working really hard this season, putting in the time both physically and mentally and really pushing myself to the limits and hopefully pushing myself over the edge to get that fourth national title,” Dake said. The team title chase could end up looking very similar to the recent Big Ten championships, which were won by Penn State. The Nittany Lions have won the last two national titles and appear to be in strong position to do it again. Penn State outlasted Minnesota and Iowa to win the Big Ten, and four Nittany Lions claimed league crowns ahead of the national meet. Top-seeded Ed Ruth will be the favorite at 184 pounds, and 197-pounder Quentin Wright is seeded second. Sophomore Matt Brown beat favored Mike Evans of Iowa to win his first Big Ten title, and Taylor is likely to rack up points even if he can’t beat Dake. Perhaps the only team outside of the Big Ten with a true shot at the national title is Oklahoma State. The Cowboys, ranked second behind Penn State, will have a qualifier in all 10 weight classes. Eight of Oklahoma State’s starters are Big 12 champions, and Jordan Oliver at 149 pounds is among four All-Americans for the Cowboys. Oliver, a 2011 national champion who worked as a training partner with the U.S. wrestling team for the London Games last summer, is 32-0 this season. “For us to be successful, we’re going to have to earn some tough, tough wins,” Oklahoma State coach John Smith said. The Gophers won the National Duals over Oklahoma State and also have 10 wrestlers in the field. Logan Storley (174) and heavyweight Tony Nelson will be among the favorites in their weight classes. Iowa should have the crowd behind it, and that helped when the Hawkeyes beat the Nittany Lions 22-16 in Iowa City back on Feb. 1. Iowa has a shot to do it again, with four wrestlers seeded second or third in their classes. Two-time NCAA champion Matt McDonough (125) will wrap up his career at the same venue where he shined in high school, and 157-pounder St. John is also among the favorites in his weight class. This year’s meet will be held against the backdrop of the IOC’s recent decision to remove wrestling from the Olympics starting in 2020. But the popularity of the sport isn’t up for debate in Des Moines, which has sold every ticket for all three days of the NCAAs. Such positive buzz can only help the international wrestling community in its fight to keep the sport on the Olympic program.